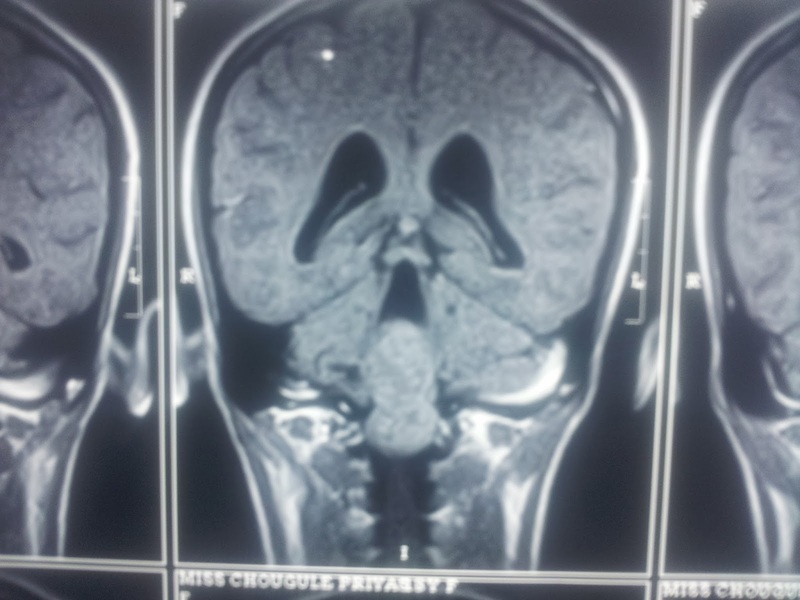 A 16 y o female patient, known case of posterior fossa mass _ Operated 2 years back. 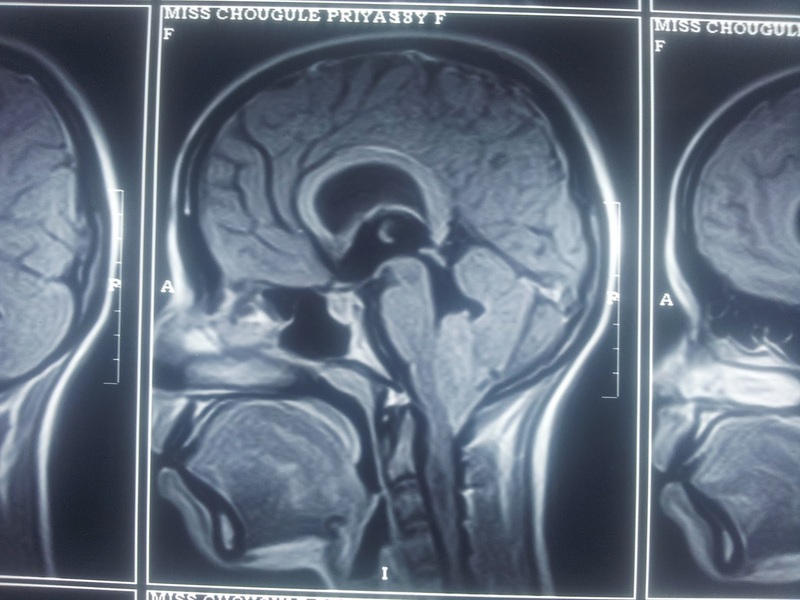 Here are few snaps of Pre operative MRI Brain images showing lesion at the floor of posterior cranial fossa with caudal protrusion through foramen magnum. Previous histo pathology report noted mentioning it to be Choroid Plexus Papilloma. Now patient presented with backache and bilateral lower limb weakness, MRI Brain with spine screening done with contrast. E/o mid line sub occipital craniotomy, complete excision of lesion. No obvious recurrent or residual lesion on post contrast T1. The Post Operative MRI Spine shows spinal drop metastasis. MRI Sagittal T2w images shows an intra medullary lesions in cervical cord, mild expansion of cord, non enhancing on post contrast fat sat T1. Similar lesions on surface of spinal cord through out its length and completely filling thecal sac in lumbar region, an abnormal enhancement along surface of cord and nerve roots of cauda equina on post contrast fat sat T1 consistent with Spinal Drop Metastasis from Posterior fossa Choroid Plexus Papilloma. 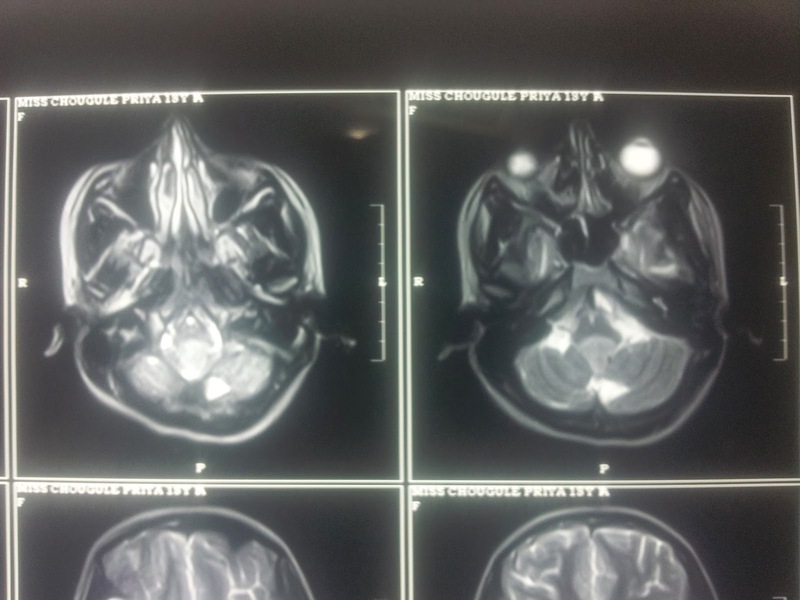 Choroid plexus papillomas (CPPs) are typically considered as benign tumors, with a favorable long-term prognosis. The standard treatment for a CPP is complete surgical resection and is thought to be curative. Drop metastasis of CPP into the spinal subarachnoid space is rare. In our case 16 year-old female who presented with back pain and lower limb weakness 2 years after removal of a posterior fossa CPP due to its spinal drop metastasis. CPP can spread via cerebrospinal fluid pathways and cause spinal drop metastasis. Therefore, it is necessary to evaluate the whole spine in addition to brain, pre operatively as well as with post operative periodic follow-up MRIs in patients with CPP.